Undoubtedly the biggest challenge for the project is actually raising the funds needed to cover the costs. These costs include design, procurement, construction and installation. A new design has been approved, the new location is agreed subject to revised planning approval. 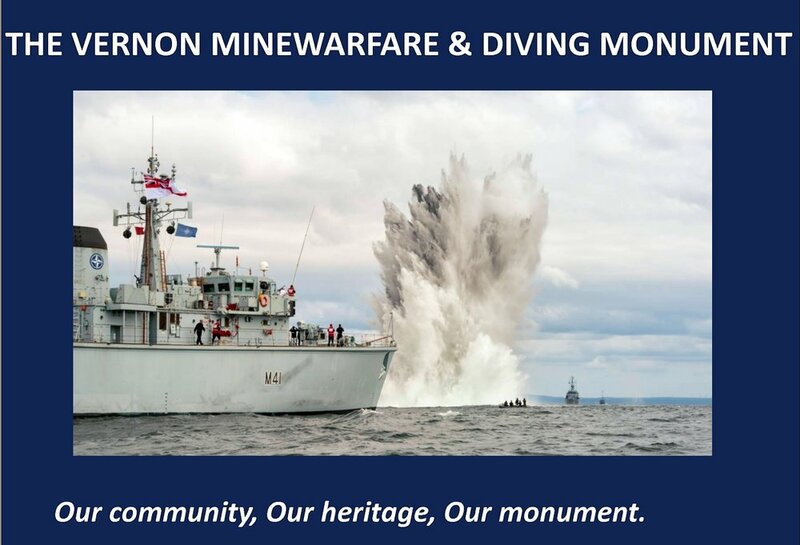 Phase Two, - the provision of suitable artwork telling the story of mine warfare and clearance diving by the men and women themselves is well underway. Now it is just a matter of sourcing the final funds to pay for it all! As a registered charity the Vernon Monument Project can benefit from Gift Aid. UK taxpayers who wish to donate and who qualify are encouraged to complete the form provided.that will automatically add 25% to every direct donation. 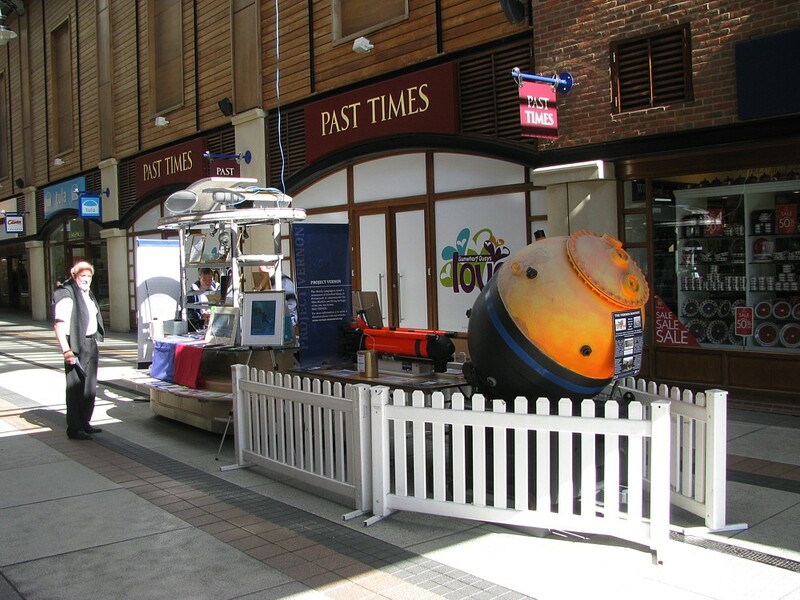 The fund can also be supported for as little as £1 per week by purchasing tickets in the Portsmouth Lottery. The campaign receives at least 50% of the proceeds and ticket holders have an opportunity to win cash prizes. 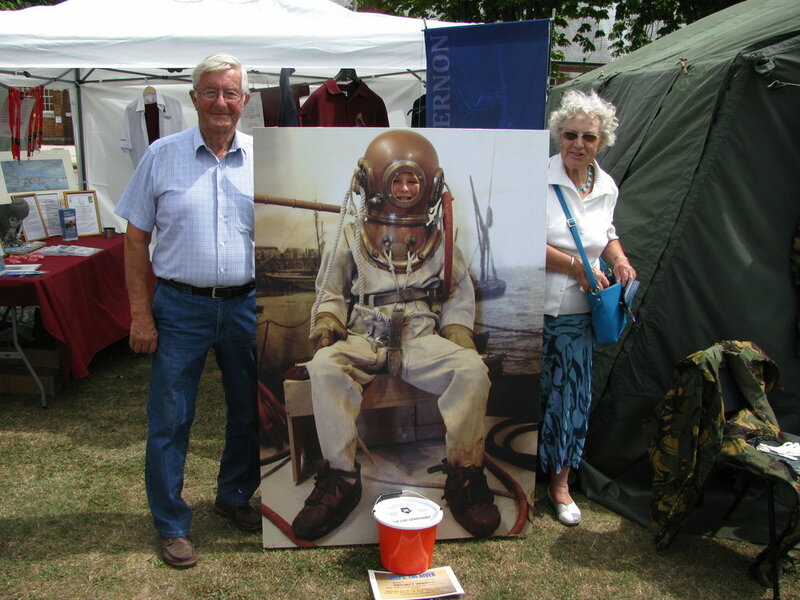 Since project inception, the managing team has commissioned a number of items of merchandise including paintings, prints, miniatures and clothing, all available at the 'Shop'. It has also held a series of major, medium and minor events to raise funds through voluntary donation and commercial sponsorship. 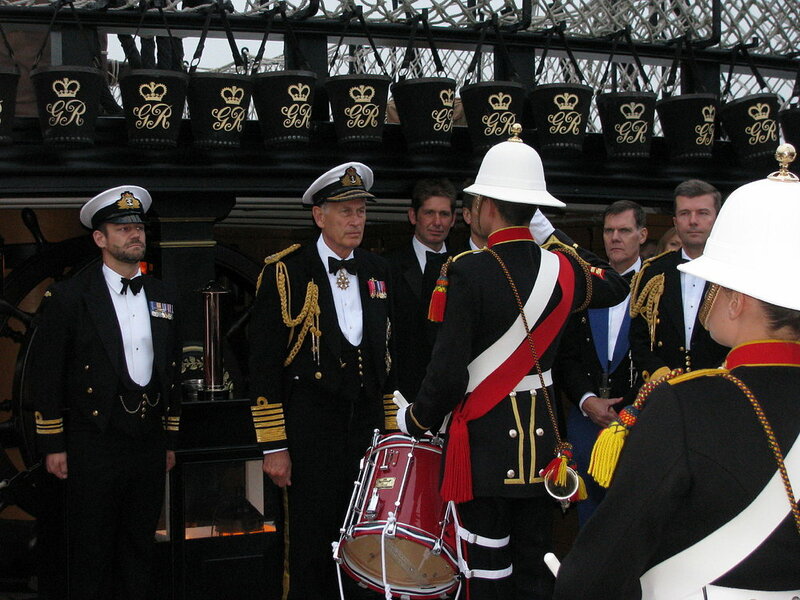 Fundraising events to date have included 'outreach' promotions at Gunwharf Quays, public events in Portsmouth Naval Base, the British Military Tournament at Earls Court and families’ days at HMS Excellent and HMS Collingwood, often in conjunction with displays by the Fleet Diving Squadron, 22 Regt Royal Engineer divers and the Historical Diving Society's Working Equipment Group. Sponsored individual and team events have included a cyclothon by mine warfare volunteers ending at Gunwharf Quays, swims around Portsea Island and the length of Windermere, the River Dart and Blackpool Sands in Devon plus a 24-hour kayak marathon in Horsea Lake and Devizes to London Canoe Races and an abseil down the Spinnaker Tower. 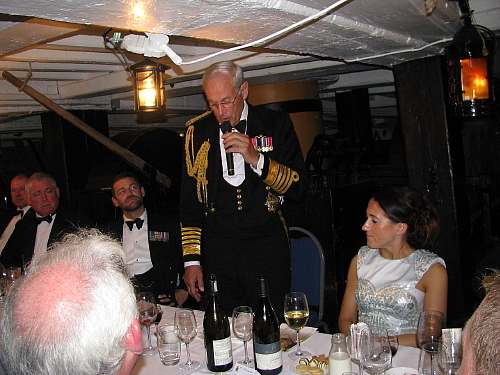 The fundraising dinner and auction on board HMS Victory was chaired by Admiral Sir Jonathon Band GCB DL (former First Sea Lord) with Admiral of the Fleet Lord Boyce KG GCB OBE DL (former First Sea Lord and Chief of the Defence Staff) as Guest of Honour. 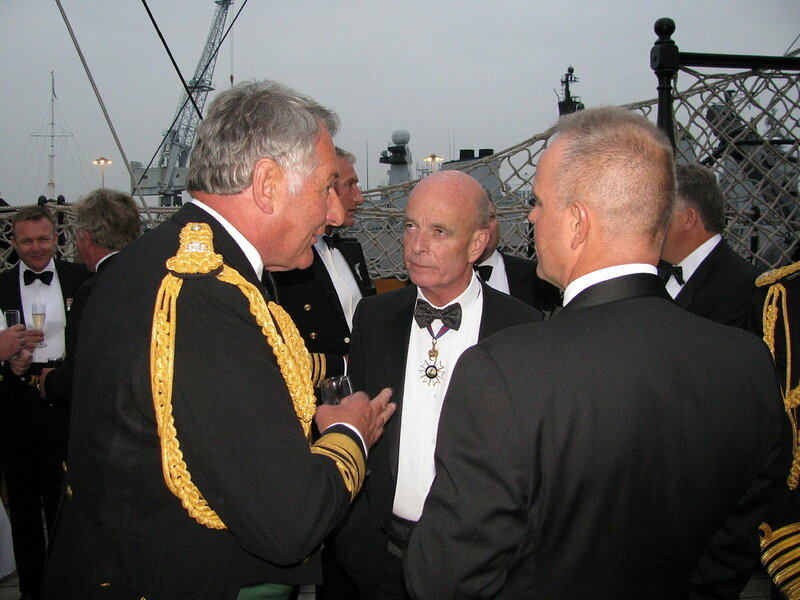 The main after-dinner speaker was Sir John Scarlett KCMG OBE (former Head of MI6). 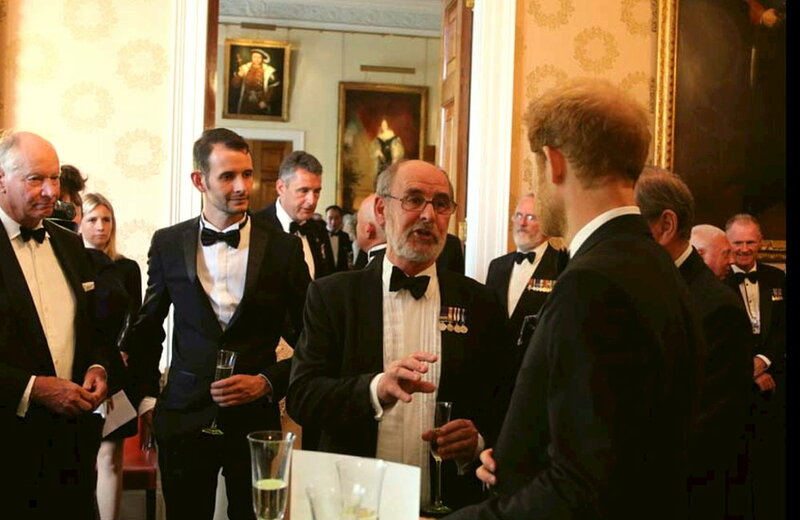 The 'Falklands 35' fundraising dinner and auction at Trinity House in London was honoured with the presence of Prince Harry, Commodore-in-Chief Small Ships & Diving. 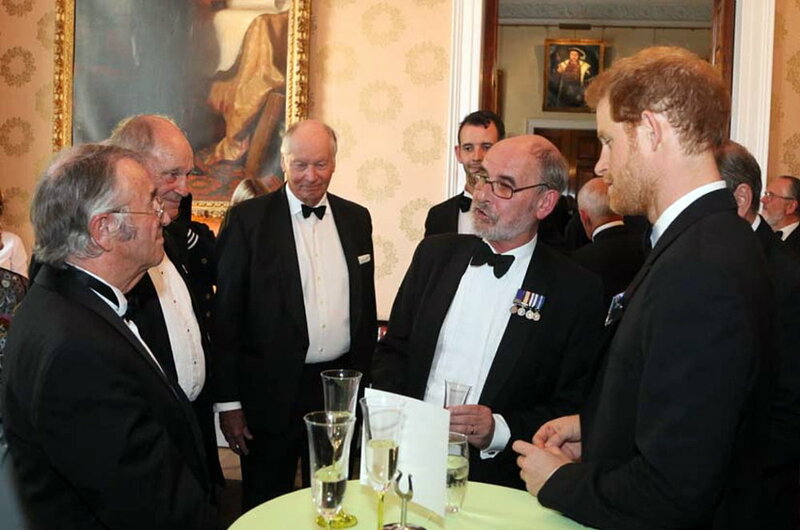 It was attended by Captain Roger Readwin RN (then Captain Minewarfare and Fishery Protection) plus many decorated veterans of the Falklands and descendants of Second World War veterans as well as more recent members of the Royal Navy minewarfare & diving community. 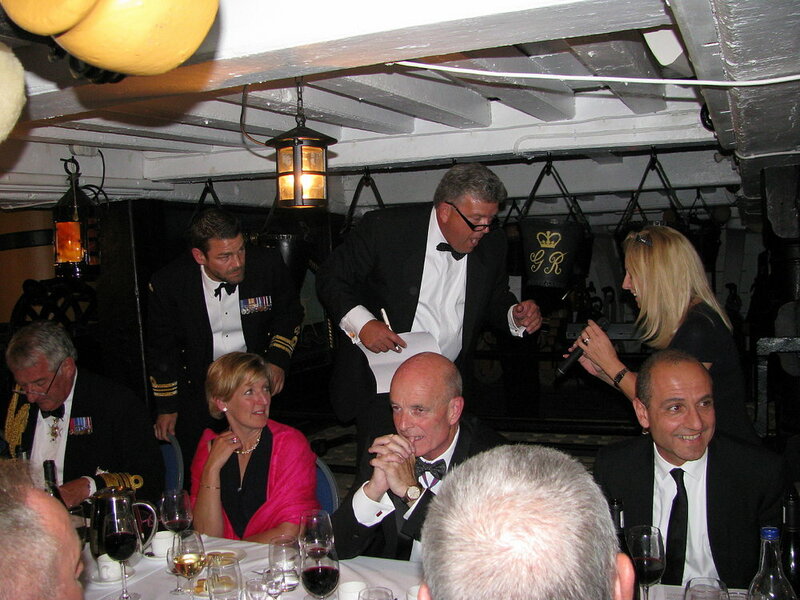 Adventurer, naturalist, author and TV personality Monty Halls (an ex-Royal Marine) was present and popular entertainer Shep Woolley provided a witty after dinner speech. A statuette of a previous design for the monument. 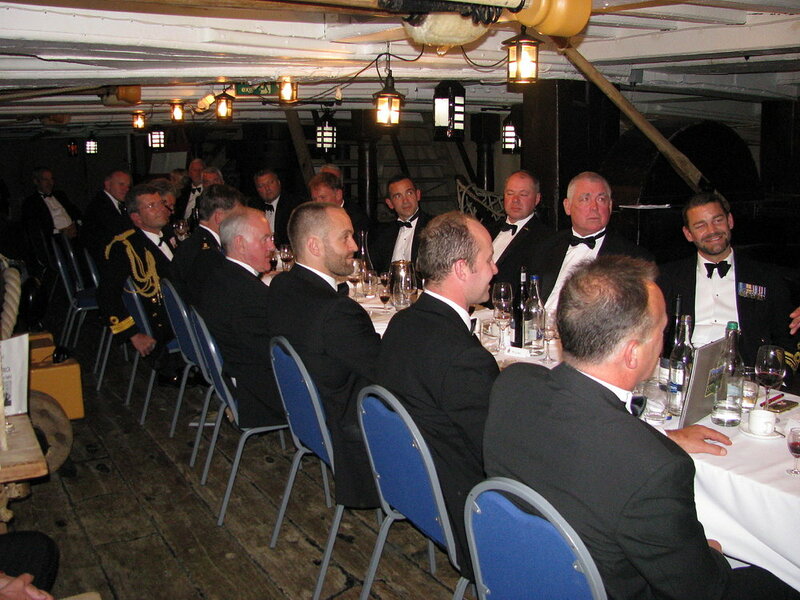 A dinner and raffle at the Royal Naval Club & Royal Albert Yacht Club in Portsmouth raised funds. 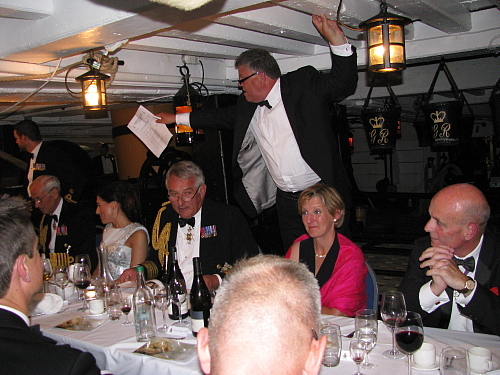 As with the dinner at Trinity House, entertainment was provided by well-known personality Shep Woolley. 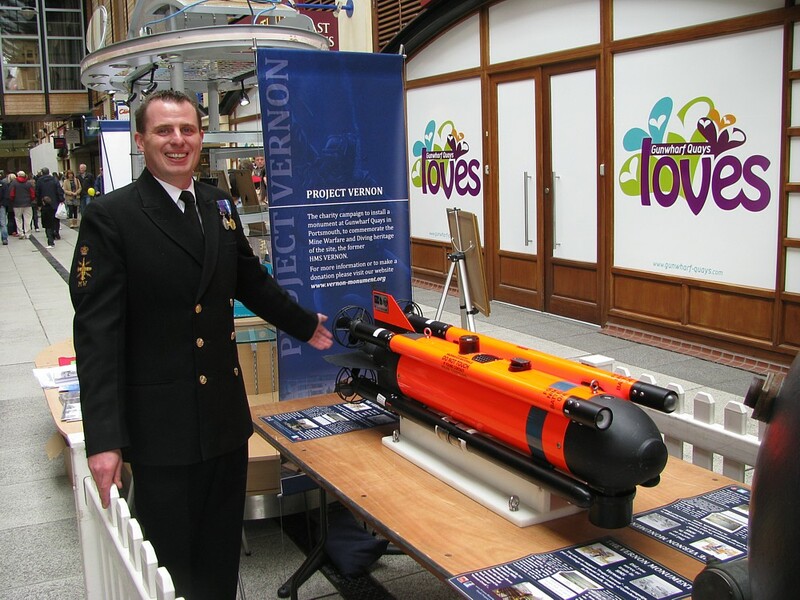 The project has also benefited from the fundraising activities of the AORNFCD (Association of Royal Navy First Class Divers), the MWA (Minewarfare Association), the MCDOA (Minewarfare & Clearance Diving Officers' Association), the TCA (Ton Class Association) and the RANCDA (Royal Australian Navy Clearance Divers' Association). 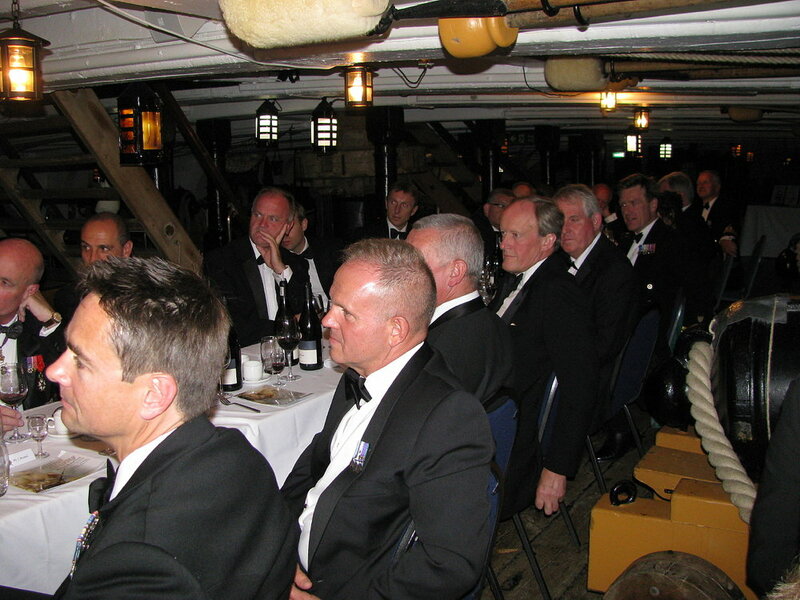 Illustrated talks have been given to such bodies as the Historical Diving Society, RNA groups, yacht clubs & sailing clubs, Round Table, Rotary and U3A (University of the Third Age). Many of these have resulted in donations towards the project's fundraising goal. If you would like to organise a fundraising event to support the campaign, please use the Contact Us form at the bottom of the Home page so that others can be informed via the project’s website, Facebook Group and Twitter account. Donations will continue to be sought and all will go towards the construction and installation of the monument and its associated displays.. The small project team are volunteers, however, the project does incur expenditure on such items as the cost of merchandise for sale, maintaining this website and the auditing requirements as required by the Charities Commission. Please visit the 'Shop' pages where Items such as mugs and Polo/T shirts are available for sale, along with prints of commissioned and donated original paintings - check out the print of 'Roughers off Port Stanley - 1982'. The original painting has been generously donated by the marine artist Adrian Thompson and will be offered for sale at auction.